The ethereal nature of glass allows an ordinary architectural design to be transformed into something extraordinary. This enduring appeal of glass facades with building designers is driving product innovation in the cladding sector. Glass remains one of the most remarkable architectural elements in the world. Its principal benefit is that glass allows natural light into a building, with latest surface coatings enabling designers to manage this in order to reduce the need for heating and air conditioning systems. However, the multi-faceted benefits of glass mean that its use isn’t just restricted to letting light into the building. Variations of traditional translucent glass, specifically in the form of back painted glass facades, extend its use far beyond what we could ever image. The possibilities with back painted glass are endless, for example, blending interior with exterior colour schemes, meaning that the façade immediately gives a nod to what the visitor is about to experience on the inside. It is this ability of glass to be worked and re-worked that allows it to transform a building into a thing of natural and elegant beauty. The benefits of using back painted glass do not end simply with its aesthetic appeal. The impressive environmental credentials of glass, being completely recyclable, means it can be broken down and reformed into new glass products, making it a firm favourite with architects looking to meet their client’s sustainability requirements. Of course, glass, being a completely inert material, has a virtually unlimited lifespan because it is rust, rot and corrosion free. Another important benefit of our back painted glass system is that it is lightweight, being up to 40 per cent lighter than a typical glass structural screen. Our Proteus GL back painted glass is an integrated modular glass rainscreen cladding system that has the ability to create a gleaming, scintillating façade like no other. 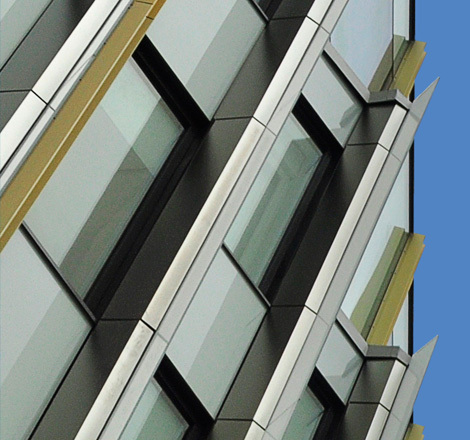 Proteus back painted glass can be used as building cladding or as part of a rear ventilated rainscreen façade system. It utilises back painted glass facing panels that are available in all sizes, including large format. The back painted glass cladding system can be supplied in a wide range of colours and is available in bespoke designs. We can also screen print the panels, which allows images to be created across the façade. The system is manufactured to exacting tolerances, comprising an aluminium honeycomb core that is structurally bonded between a toughened back painted glass face and a lightweight metal rear skin. Each panel is supported by our aluminium carrier system and ancillary components. It can be installed on to any type of wall construction. The Proteus GL back painted glass rainscreen system offers architects a wealth of design options with a range of standard colours, or more bespoke designs including screen printed options which allow large images to be generated across a façade. When a building’s façade is clad in glass it creates a visually arresting aesthetic effect, especially with its ability to play with colour and light. Its ability to reflect light, whilst being able to specify a striking or more subtle back-painted colour, gives a fresh new perspective to any façade. Advances in cladding technology mean that some of the most iconic architecture of recent times is being constructed using glass. As a modern architecture material, glass takes some beating, especially when specified as a rainscreen façade solution. 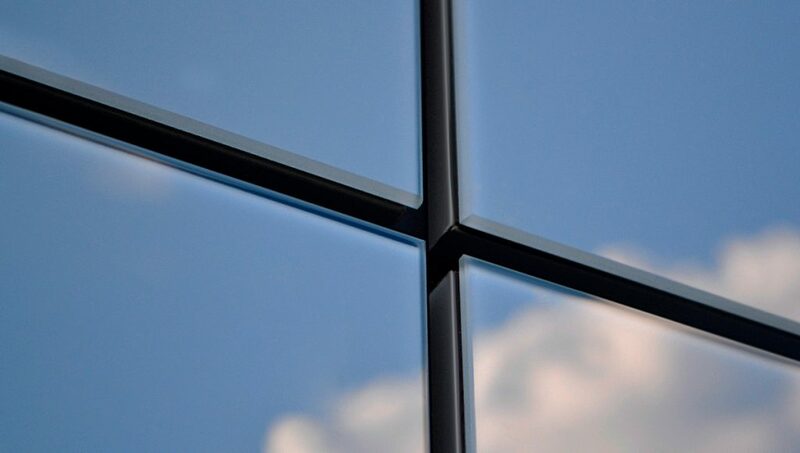 Back painted glass, being opaque, has the dual benefit of being suitable for rear ventilated rainscreen cladding applications. Many of the industry’s leading architects and visionary designers have used glass in their iconic buildings, in ways that are both ingenious and astonishing in equal measure. Back painted glass, with its endless possibilities, is providing architects with the same ability to this, creating designs that we could only ever image previously. Here at Proteus we celebrate the brilliance of scintillating back painted glass facades. For more information on our back painted glass cladding, click here. Alternatively, call: 0151 545 5075.